On to the Kings! The final group of Court cards are the Kings, related to the element of Fire. As the Queens are tied to the Empress, so the Kings are tied to the Emperor. And like the Empress and Emperor, we find a balance between the Kings and the Queens. Where the Queens represent Water, the Kings represnt Fire. Whereas the Queens tend towards more intuition and human concerns, the Kings bear the characteristics of Fire- here we have people more goal-driven and energetic, focusing first and foremost on results rather than relationships. While this can make for a powerful leader, the Kings might sometimes need a reality check, as sometimes that human factor can be sacrificed. 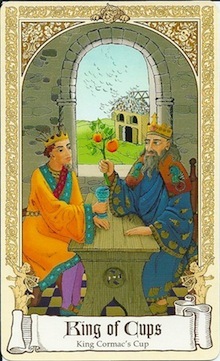 Notice also that these Kings are tied to Fire- while good leaders, and powerfully charismatic figures in many cases, they need the support of others; as a flame needs a fuel source, so the Kings need both a direction and a purpose, and the means of support to accomplish the great things they dream. 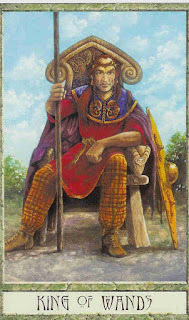 This King comes to us from the Druidcraft Tarot, and reflects this King fairly well- this guy is Fire of Fire- pure drive and energy, his most notable characteristic is willpower. He will be of one mind, certain in his decisions, and will unfailingly meet any challenge that comes in his way. With all this Fire energy, we also find a wonderful husband and family man, always there for his loved ones. The King of Wands is also a very charismatic figure, and often has little trouble leading the way- he's a natural leader, full of contagious energy and great ideas. The King is probably the most "kingly" of the Kings, very similar to the Emperor in many ways. In his more negative aspect, this King can be domineering and overbearing- he may be a good leader, but a weakness is that he expects to be in that position; he may have trouble following, or be too stubborn to hear the ideas of other people, and may actually come to regard any challenge to his authority or questioning of his ideas as a challenge or insult, and react with a fiery temper. But like Fire, this King has a great energy, and will never fail those he loves. I always thought of this King as somewhat like Denethor from the Lord of The Rings books. He was a very intelligent, thinking type of guy- at one point it's pointed out that "He has long sight. He can perceive, if he bends his will thither, much of what is passing in the minds of men, even of those that dwell far off. It is difficult to deceive him, and dangerous to try." A thinker, this King combines the energy of Fire with Air, and is more analytical and less impulsive than most people. He usually considers things carefully, and thinks many moves ahead. In this image, the King is shown as a chess player, considering all the things that could happen. The King of Swords is more of an idea man, relying more on logic and thought than the sheer charisma and energy of the King of Wands, but in this way also can be a powerful leader. However, this same analytical nature can make him seem cold and distant, even to those he loves. The King is also an idealist, holding to a high standard of ethics and a sense of right and wrong, and can sometimes judge others harshly according to this. Another negative aspect of this King is the fact that he can use that very same sharp-edged intellect against others, using harsh words as weapons against others he percieves as threats or rivals, or people who fall on his bad side. He doesn't often hold grudges, but his anger can be a formidable thing when aroused. The King of Cups is a father figure, first and foremost- his focus is on family, and he will do anything he can for his family. This King is the guy who loves kids and is devoted to his family, and can be found volunteering, coaching, mentoring, and trying to make the world a better place. His leadership is by love, not by strong ideas or by charisma. People look to him as an emotional provider, and as a source of counsel and insight. Though a strong family figure, he can be emotionally manipulative, perhaps even a little self-centered. He may be emotionally maniuplative to try and keep the people he loves close by, tending towards smothering rather than allowing a family to grow. 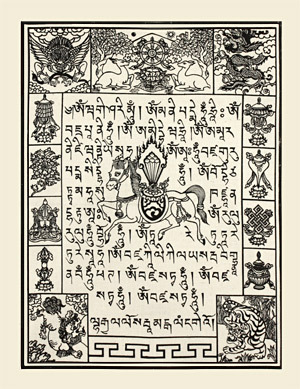 In his more negative aspects, this King can tend towards emotional unbalance, tending to overreact to minor events, and to brood over past mistakes. This King also wants everything to be perfect, and can be prone to depression when things don't work out perfectly. 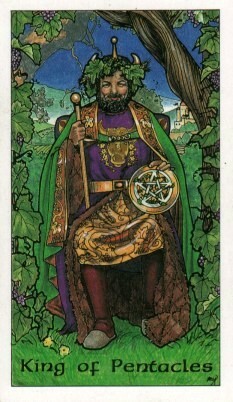 Finally, we have the King of Pentacles, combining Fire and Earth. This King is probably the most balanced of the Kings, and his strong ties to Earth mean that he's a generous and giving person. Posessed of a great deal of common sense, this King will always give everything he can to help out other people, and will always repay a favor. The King tends to be very practical and hard-working. He's the least outgoing of the Kings, also, and tends to be a quiet but hard worker, building up his kingdom based on hard work and thoroughness. Though somewhat reserved, this King can be a very loyal friend and has a strong mind for business or practical affairs- in this regard, he's much more "down to earth" (pun not intended, once again) than the other Kings, and sometimes can be a little too conservative and stuffy. Tradition carries a great deal of weight for this King, and this can sometimes be to the loss of new ideas or innovations. The more negative aspects of this King can be a tendency to regard anyone who does not share his outlook as impractical and lazy, and with this, a tendency to judge them harshly. Anything outside the norm can sometimes be seen by him as frivolous or foolish. This King may also be concerned with his outward appearance in the world, and he may be somewhat vain, trying to project an image of being a pillar of the community and a strong upright figure. But it may be just that- an image, at the expense of anything real, and having any firm position on any issue. So the Kings, overall, tend to be powerful figures and leaders at their best, as well as good providers and the backbones of their communities or families. At their worst, they can be petty tyrants, seeking only control without guidance, love and compassion that are the marks of a good leader. Though the Court cards often represent people, these too are variable in exactly who they represent. There are a lot of systems to determine what Court card a person falls under, these cards can change- a person may find themselves behaving or thinking differently depending on the situation they find themselves in. It's true, that people will often have a dominant set of traits and thought patterns that make assignment to one of the Cards easy, but keep in mind that this too can change over time.